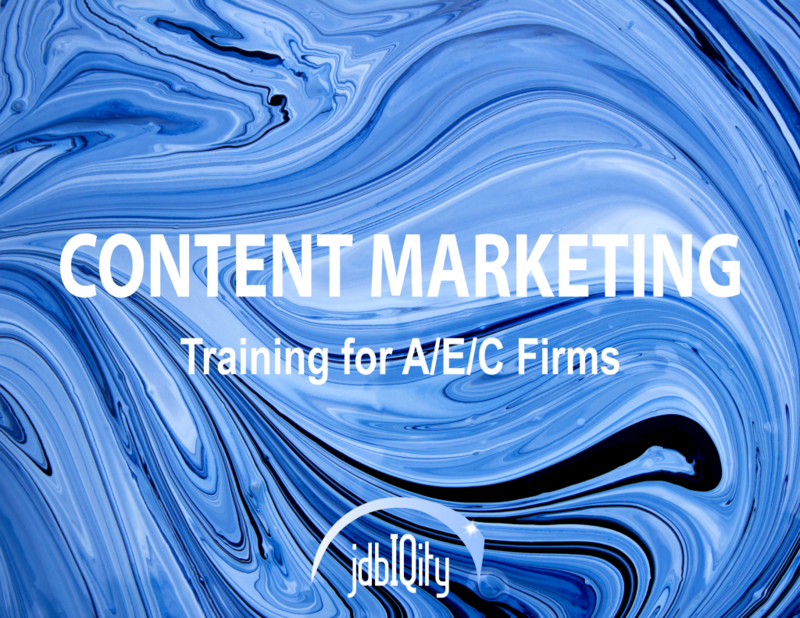 jdbIQity’s new Content Marketing Training Program is a half-day session that will equip your team with the skills to become Content Creators! According to Demand Metric, 91% of Business-t0-Business (B2B) marketers use content marketing. However, the architecture, engineering, and construction industry (A/E/C) lags behind other industries in content publishing. Firms must rethink their focus, as Demand Metric’s research has found that one-fifth of the time spent on the Internet is spent viewing content, which costs 62% less than traditional marketing and generates three times as many leads as traditional outbound sales techniques. Content marketing is not only the future, it is very much the now! Content marketing positions the authors – and your firm – as thought leaders, and provides a valuable resource to the sales process. It is far more than just blogs, although an informative blog can greatly enhance your website’s Search Engine Optimization (SEO) and become the number one source of traffic to your website. But how do you get started with content marketing? Interested in learning more? Contact Scott D. Butcher, FSMPS, CPSM at 717-434-1543 or sbutcher@jdbe.com. Scott is an A/E/C industry thought leader who has written hundreds of blogs and articles, researched and written/co-written 20 books and ebooks, and delivered more than 250 presentations, including keynote programs. He is a Certified Professional Services Marketer through the Society for Marketing Professional Services (SMPS) and is also Content Marketing Certified and Inbound Sales Certified through the HubSpot Academy.